Tomorrow we may see another small push higher to hit the 62 % retracement. 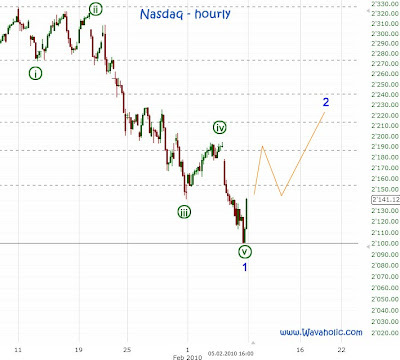 The Nasdaq has retraced nearly everything of last week's drop thus I think the alternative count is actually the best count for the Nasdaq. The perfect target for this Minor wave 2 is 2187. 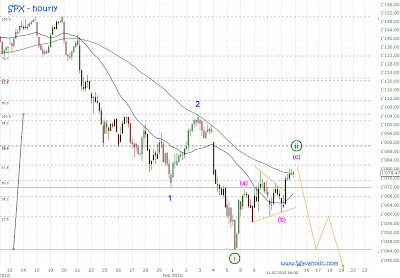 There lies the 38 % retracement level and wave [a] equals wave [c]. So, I expect it to be reached tomorrow which should complete Minor wave 2 (alternatively only wave [a]). 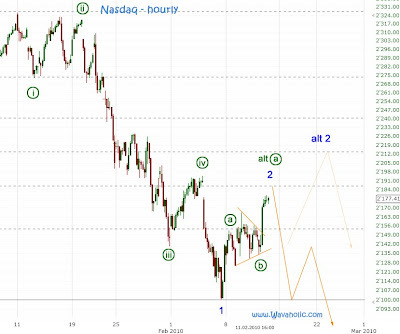 Different counts for the SPX and Nasdaq but the same forecast for tomorrow: a small rally in the morning and then mostly downwards for the rest of the day.